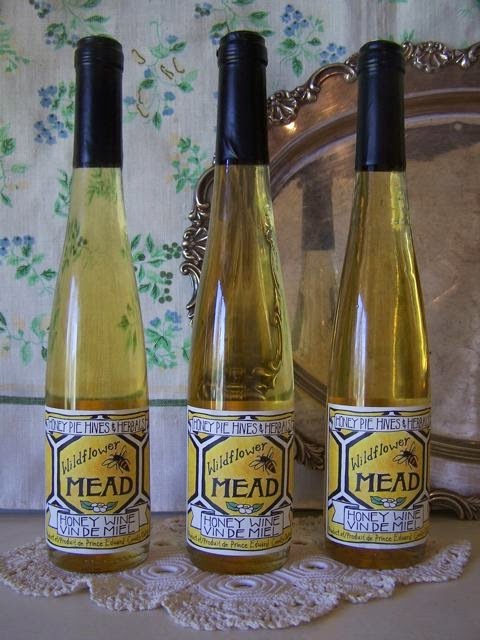 Honey Pie Hives & Herbals: Mead is here at last! Mead is here at last! Finally! The news we've all been waiting for - the mead is ready for sale!! Here it is in all it's farmy, old timey glory. The back label reads, 'Mead is a traditional wine made from honey, long ago considered the drink of Kings and Queens. Enjoy the delicate, complex floral bouquet of our Wildflower Mead with meals or on its own. Handcrafted in small batches on our family farm in Prince Edward County.' You can buy it at our farm store at 705 County Rd. 24 or through our website. This beautiful basket of flowers is bee balm or monarda. It is also called bergamot and Oswego tea. Talk about the herb with a thousand names! We call it bee balm of course. Is has the flavour of earl grey tea which is why the pioneers called it bergamot. Bergamot is actually a citrus fruit from Italy which is used to give earl grey tea it's distinctive flavour. 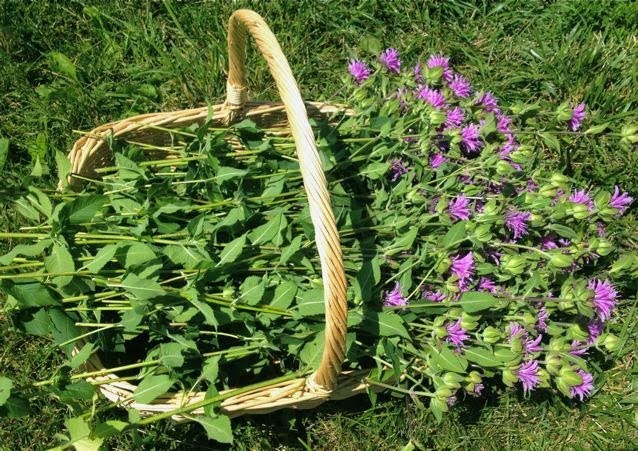 We use bee balm in our Femininitea, a herbal tea for female complaints - good for PMS and menstrual cramps. We've had lots of great feedback about how well this tea works - it really helps if you have someone to make it for you as remembering to take it when you need it is the biggest challenge. 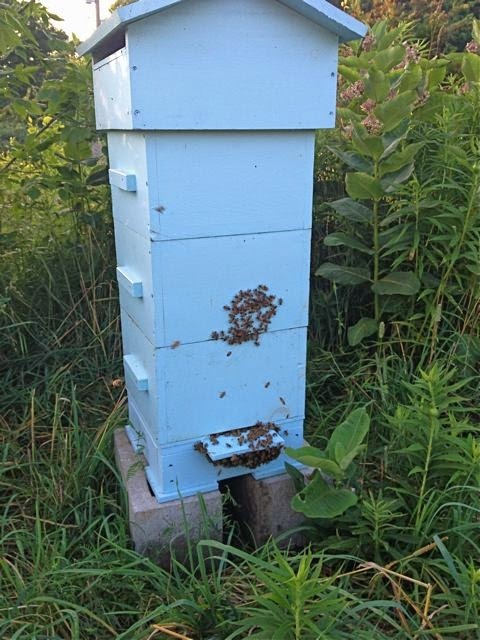 We caught a lot of swarms of bees this summer and finally managed to get one into our Warre hive. 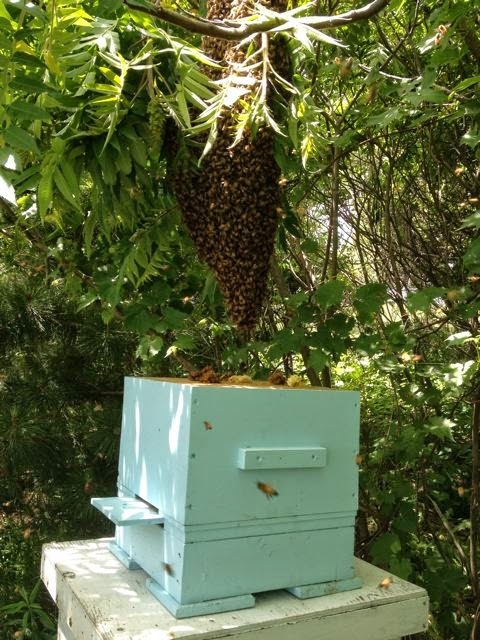 This is a top bar hive that a friend made for us. We use the standard Langstroth hive which is designed for honey production. The Warre hive is an experiment we are conducting to see if the survival of the bees is improved. There are many who claim this is a better way to keep bees but it seems that there would be less honey production. We will see how they overwinter. This is the Warre hive later in the summer. It's well established and overflowing with bees. We added two more boxes and the peaked roof. The colour is closer to the actual blue we used to paint the hive in this photo. Looking good bees! 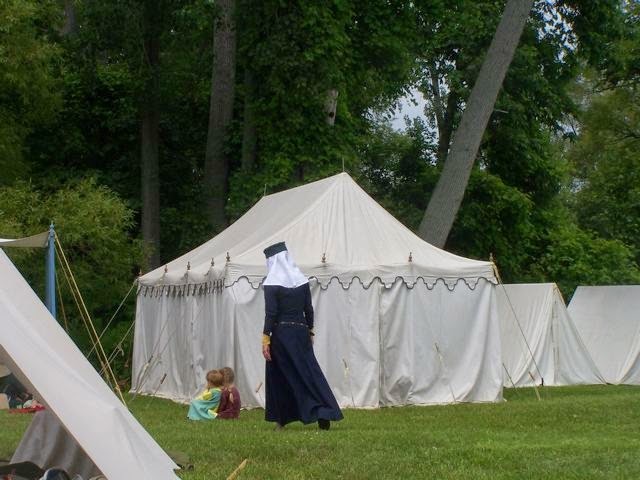 We had the pleasure of attending a medieval reenactment this summer. 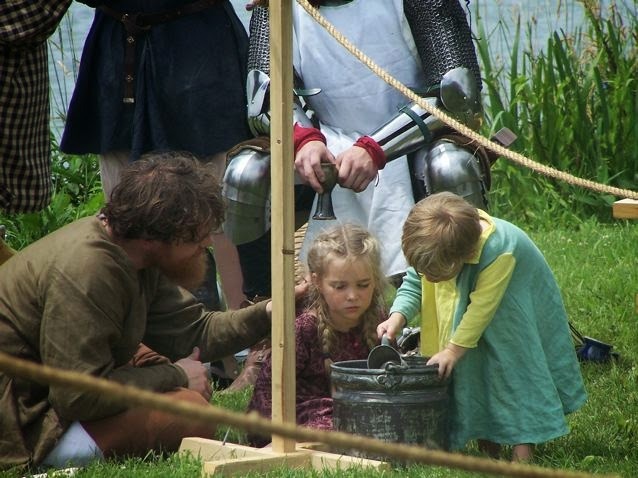 We had just discovered the world of larping (Live Action Role Playing) through our 10 year old son and then got to see it in action with knights in armour and ladies drinking from goblets. It was done so thoughtfully and with so much attention to detail. I was entranced by the canvas tents and wooden furniture. There were lots of children in costume too. We really wished we had some costumes to wear. Better start planning for next summer right away! I want a green dress and a tent. These people definitely need mead! 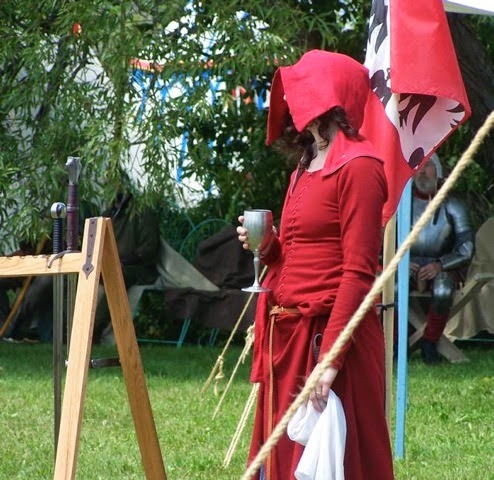 The elegant woman in the red dress looks like she already has a mead in hand. This summer has been a difficult one for my family. We lost my mother Patty Woodyard after a brief battle with pancreatic cancer in June. 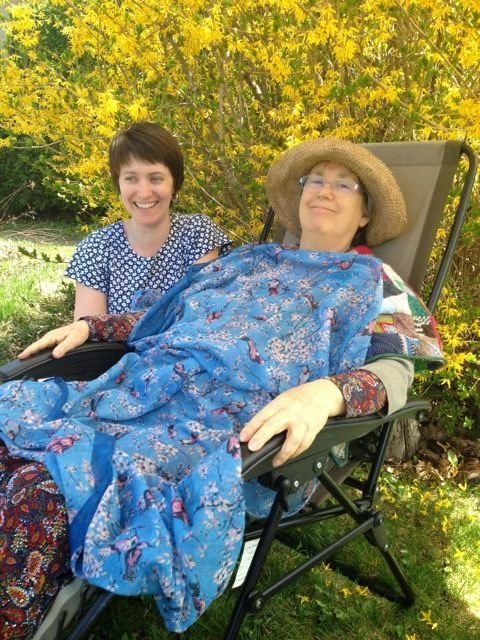 This photo was taken the last time I saw her up and outdoors - on Mothers' Day. My mother was well known for many things, her generosity, her hospitality, her creativity, her love for her family and for those who came to visit her, her thankful book. She asked everyone who was in the house every evening to tell her three things they were thankful for and she wrote them down in her book. She left behind so many books spanning years of gratitude. I can still hear her asking me, "What are you thankful for this day? "Today I am thankful for my wonderful mother, my whole family, and my beautiful home.